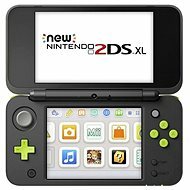 Game Console - The system is light but still packs the same power and performance as the Nintendo 3DS X-large and has built-in NFC support for amigo cards and figures; instead of a 3D effect, it boasts a lower weight. 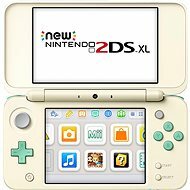 Game Console - same design, performance and NFC reader to support amiibo functionality as the New Nintendo 3DS XL, but plays games in 2D. Lower weight. 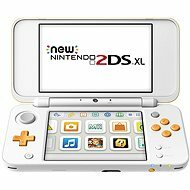 Game Console - has the same design, performance and NFC reader to support amiibo figures as its most powerful sibling New Nintendo 3DS XL, has a lower weight than the 3DS. Game Console obdélníkového tvaru se skládací konstrukcí se dvěma LCD displeji. Disponuje stejným designem, výkonem i NFC čtečkou pro podporu amiibo figurek, jako jeho nejvýkonnější sourozenec New Nintendo 3DS XL a namísto 3D efektu se může pochlubit nižší hmotností. 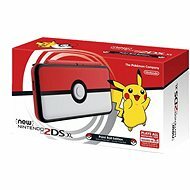 Game Console - rectangular shape with folding design; two LCD screens with Mario Kart 7 pre-installed. The system is light but still packs the same power as Nintendo 3DS X-large and has built-in NFC support for amigo cards and figures; instead of a 3D effect, it boasts a lower weight. 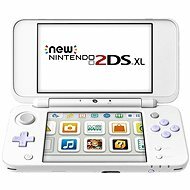 Game Console - The system is light but still packs the same power and performance as Nintendo 3DS X-large and has built-in NFC support for amigo cards and figures; instead of a 3D effect, it boasts a lower weight. Do you miss playing the classic video games that used to keep you and your friends entertained for days on end? Then this NEW Nintendo 2DS XL Minecraft - Creeper Edition console is here to take you on a magical trip down memory lane. With a portable console, you can play at any time – whether you're waiting in a queue or sitting on public transport. The NEW Nintendo 2DS XL Minecraft - Creeper Edition console provides hours of entertainment,. It fits easily into your pocket and is light enough for you to keep playing for hours. Console, Game Controller 1pcs, Pre-installed games, Power adaptor, Ar cards, Memory card Done! For shipping to other EU countries visit this page NEW Nintendo 2DS XL Minecraft - Creeper Edition. 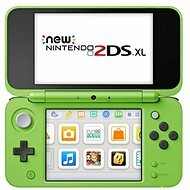 Für Versand nach Deutschland, besuchen Sie bitte Nintendo NEW 2DS XL Minecraft - Creeper Edition. Chcete doručit zboží do Česka? Prohlédněte si Nintendo NEW 2DS XL Minecraft - Creeper Edition. Chcete doručiť tovar na Slovensko? Prezrite si Nintendo NEW 2DS XL Minecraft – Creeper Edition. Für Versand nach Österreich, besuchen Sie bitte Nintendo NEW 2DS XL Minecraft - Creeper Edition. Magyarországra történő kiszállításért tekintse meg ezt a termékoldalt: Nintendo NEW 2DS XL Minecraft - Creeper Edition.